Join us on for the sixth and final stop on our cross-country modern design road trip with Dwell. Our first destination in May was Seattle, Washington; then we stopped in San Francisco, California; followed by Los Angeles, California; then we were in Houston, Texas; in October we traveled to Atlanta, Georgia; and this weekend we’re traveling to Miami, Florida! The Monogram Modern Home Tour will continue its modern design road trip south to Miami where it will join the Miami Design District on December 2nd and 3rd. The Monogram Modern Home will be open for tours, live product demonstrations and culinary tastings prepared by our tour chef on Saturday, December 3. For accredited industry professionals, please join us on Friday, December 2, for a day of continuing design education. For additional details and to register for the CEU’s, visit the Dwell website. Find Monogram on Twitter and Instagram. Find Dwell on Twitter and Instagram. In honor of Thanksgiving this week, we are sharing a holiday favorite from the Monogram chefs. See more of their recipes and musings on All in Good Food. Abt is the nation’s largest single-store retailer of electronics and appliances in the country, showcasing over 100,000 square feet of numerous products to choose from. Located in Glenview, Illinois, they are famous for being a one-stop shop, spanning from kitchen appliances to home entertainment systems. Already well-known within the industry, Abt decided to outdo themselves yet again with their Inspiration Studio. 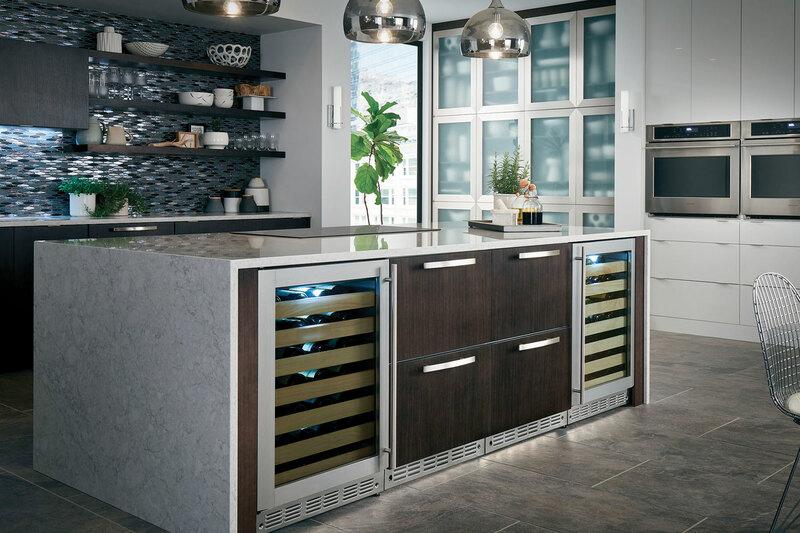 Monogram showcased its own style by displaying 22 of our unique products spread throughout the vignette, varying from our champagne-flushed induction cooktop to the commercial-modeled French door wall oven. In 2013, Monogram originally debuted our Design Center in downtown Chicago located within the Merchandise Mart, and continues to hold training, demonstrations and overall product experiences. Having another Monogram display within Abt’s Inspiration Studio, opens up more possibilities to those not living in Chicago but who still want the opportunity to explore new kitchen concepts. Sadly, Bob Abt never had the chance to see his idea come to life since he passed away in 2015, but his memory lives on throughout his family and his employees. He took a small family-owned business which started in 1936 and turned it into something bigger than what anyone could have imagined. “We named the space the Inspiration Studio because Dad was an inspiration to the entire staff at Abt who respected him not just as a boss, but as a mentor,” says Mike Abt. Monogram is excited to be a part of what the Abt brand stands for and what the future holds.